Men's Ornate Stamped all Sterling Silver Watch with a Mohave Purple Kingman Turquoise Watch Face Native American Indian Jewelry by Navajo Artisan Harry Spencer Closeout Final Sale. All Sterling Silver Watch is embossed and ornately stamped with various Native American Symbols including Running Water (Constant Life), Sun Rays (Happiness), Cactus Flower Blossom (Courtship), Day Night (Time). The watch tips measure approximately 1 3/8 inch by 1 3/8 inch. 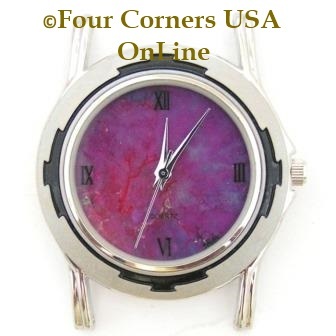 The watch is comes with a Men's Mohave Purple Kingman Turquoise Stone Stainless Watch Face - 1M as pictured to the right. For your convenience, we offer three different lengths to accommodate your wrist size. Please choose length when ordering. Simply take a measurement of your wrist to determine total size. The flex portion of the watch will expand 1 1/2 to 2 inches to get over the hand. In the event you need it adjusted once received, links can be removed from the flex band portion. Although this can be a little tricky if inexperienced, you local jeweler can easily you. All our Flex Bands are Stainless Steel and adjustable. If you are uncertain about this process, it is advisable to visit your local jeweler. Please Note: The Mohave Purple Kingman Turquoise Stainless Watch face that comes with watch is 1M, the watch face has more red and orange in the face than the watch face pictured. The actual watch face that comes with the watch is 1M.